May is “official" Bike to School Month, when communities rally to support riding, walking, and any other non-motorized forms of commuting. While Brian Meyers, of Tacoma, Washington, will be taking part in the celebration, the truth is that this month won’t be too different than any other month for him and his family. Brian, a member of the Raleigh-sponsored Hodala cyclocross team, rides a bike just about everywhere, including taking his two kids to and from school. While committed to cycling as his main form of transportation, Brian’s dedication isn’t fanatical; it’s balanced, accommodating, and achievable for many of us. We caught up with him to get some tips on how to make the goal of leaving the car at home a reality. Raleigh: What was the motivation for choosing your bike as your main transport? Brian: I think my initial reasoning was that I just felt that it was the right thing to do. Cars can be so wasteful and demand so much in terms of money, resources and infrastructure. Cities would be such a nicer place if more people would choose to walk or ride. My motivation has gone through changes over the years. Sometimes it’s about fun. Sometimes it’s about fitness. At a certain point it just becomes habit and you don't really think about it anymore. 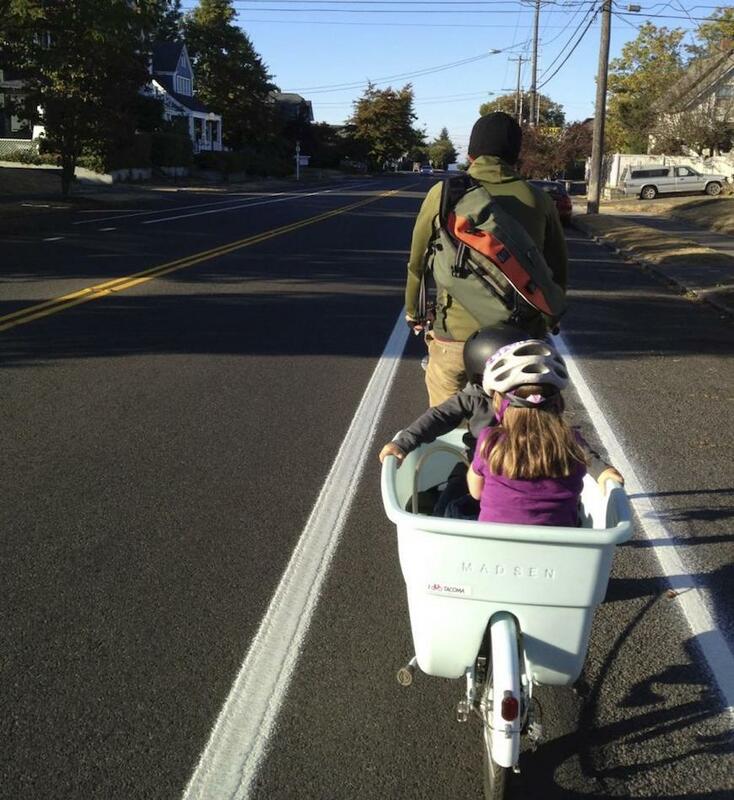 Raleigh: You’re also riding your kids to school everyday, so they’re learning by example. With two young kids (ages 6 and 8) in a relatively rainy city, how do you make it work? Brian: They typically don't pedal themselves because of the busy street we use to get there, though they will pedal a few times this month for Bike Month. They will definitely ride on Bike to School day. When they pedal, we take the long way around to avoid the traffic. It takes quite a bit longer, but they love it. 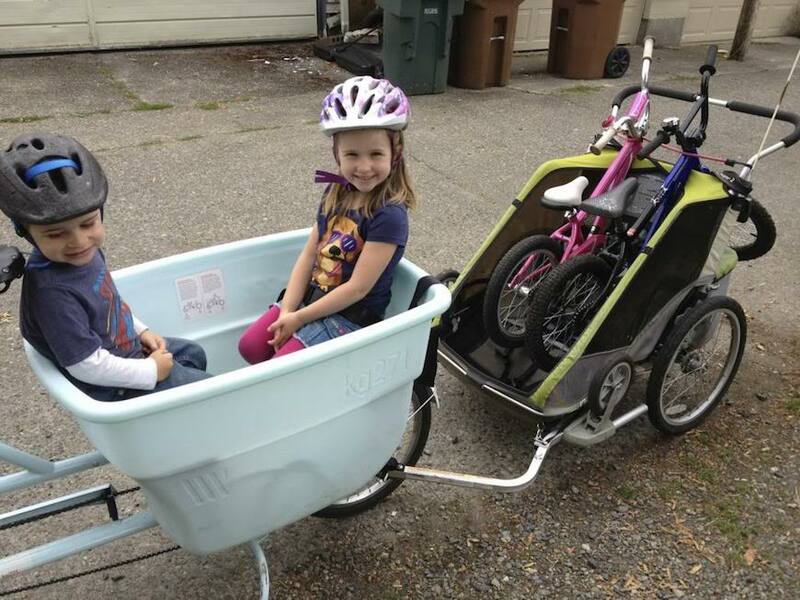 [Since they’ve grown out of the trailer], I typically use a bucket bike to get them to school and a cargo bike for longer trips that require more carrying capacity. If it's really raining, we usually just walk. Raleigh: Have they ever known any other way to get around? Brian: We will occasionally use the car for errands when there just isn't enough time in the day. They only time I drive them to school is with the mountain bike on the rack on my way out of town for a ride. Raleigh: What are your top three tips for other parents that want to make riding to school and work a priority? Brian: Probably the number one perceived obstacle to riding around here is the weather. People are always amazed that I'm out riding when it's raining. I always tell them that it's only water, and it won't hurt you. Other than that I'd say my main tip is to be prepared. You probably should know how to change a flat, and have the equipment with you to allow you to do so. And number three is to lock up your bike. Always. 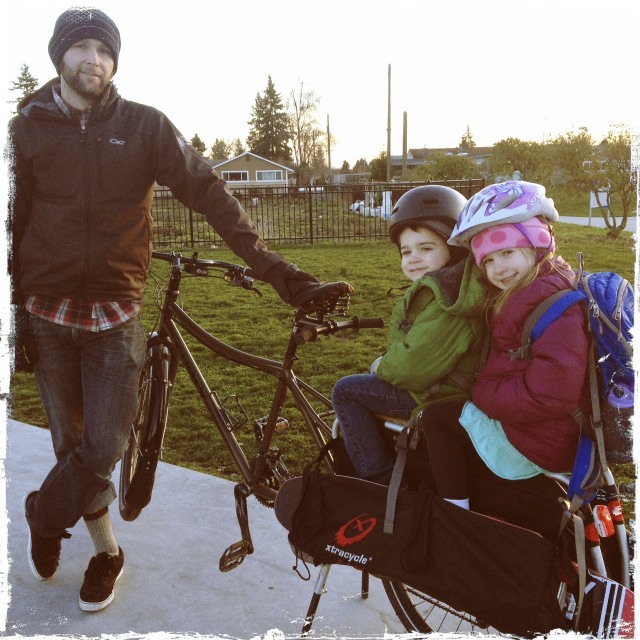 Raleigh: What has been the biggest unanticipated benefit of riding with your kids to school? Brian: I love that when we are running around the house trying to get out the door to go somewhere, my kids just assume that we're going by bike or walking. I hope that as they get older they will continue to see riding and walking as normal, and the car as optional and rarely necessary. Words to live by. Thanks, Brian, and happy Bike To School and Work Month to all!